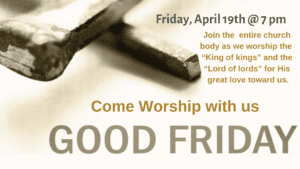 All are welcome to join us Friday, April 19th at 7pm as we come together to remember the ultimate sacrifice of our Lord and Savior, Jesus Christ and worship the “King of kings” and the “Lord of lords” for His great love toward us. 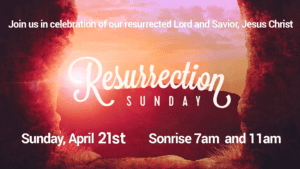 Join us Sunday, April 21st in celebration of our resurrected Lord and Savior, Jesus Christ. “Sonrise” Service is at 7am (followed by a continental breakfast) and 11am Service as usual. 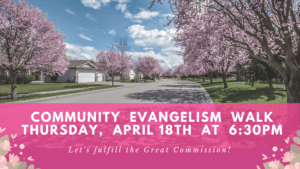 There will be no 9:45am Discipleship Hour classes, or 11am Children’s Church, Mission Friends, or Nursery on this day. They will all resume the following week. The New Members Ministry is available today to take pictures of members for the digital directory. If we don’t have your picture or you want to update your current picture, please meet us in the sanctuary immediately following each service.